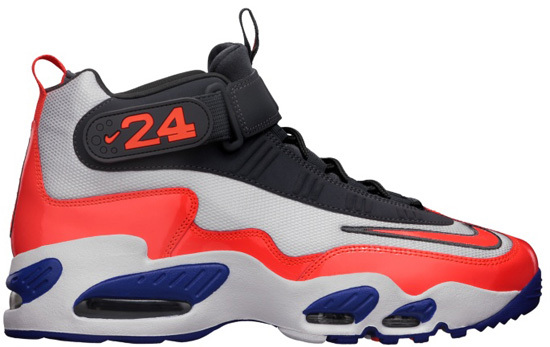 The Nike Air Griffey Max 1 is returning for another round of releases in 2013. Kicking things off for the return of the Nike Air Griffey Max 1 will be this all new "Crimson" colorway. Coming in a white, total crimson, hyper blue and white colorway. Featuring a white based upper with total crimson, hyper blue, silver and anthracite accents. A general release, they will be available at select Nike accounts worldwide on Saturday, April 13th, 2013. Retail is set at $150 for men's sizes which is a $10 price increase from previous Griffey 1 retro releases and, they will also be available in full family sizing down to toddler. Enjoy this first look at the return of the Nike Air Griffey Max 1 in white, total crimson, hyper blue and white below. For those of you looking to pick up a pair when they release, check in with your local spots to see if they will be receiving them. If you're looking to lock down a pair now, you can click here to buy them on eBay.